Fluorescent microparticles based implantable system referred, as “smart tattoos” show potential for continuous monitoring of interstitial glucose level, which can be correlated with blood glucose levels. Such implants can be interrogated transdermally using simple optical instrumentation. In the present work, a near-infrared (NIR) dye pair consisting of Alexa fluor 594 and Alexa fluor 647 have been used to develop glucose sensitive alginate microsphere sensor. NIR dyes have higher wavelength, higher intensity, low scattering, less photoquenching and bright fluorescence, which reduces color selection problem during confocal microscopy detection. The sensor works on the principle of fluorescence resonance energy transfer (FRET) and competitive binding (CB) of glucose and its analogues. The sensor comprises of AF-594 conjugated with dextran-amino as donor molecule and AF-647 labeled with apo-GOx as acceptor molecule. In order to stabilize the sensor, multilayered nanofilm coatings were applied using layer-by-layer (LbL) self-assembly techniques, which also reduces the leaching of sensing reagents effectively. In order to increase movement of these sensing reagents inside microsphere, the core is partially dissolved. 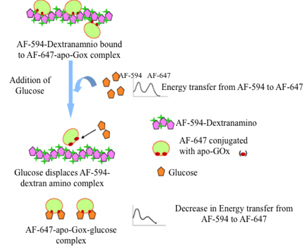 The glucose diffuses inside the microspheres and displaces AF-594-dextran-amino from AF-647-apo-glucose oxidase. This results in more distance between AF-594 and AF-647 dyes which in turn leads to decrease in energy transfer from donor dye AF-594 to acceptor dye AF-647. A linear increase in AF-594 to AF-647 peak ratio has been observed till 31.5 mM glucose and linear range response sensitivity is 2.12% per mM glucose. The response range covers both physiological and patho-physiological range showing the sensor can be more amenable to in vivo use, when implanted in the dermal tissue.